The members opening of Who Shot Rock & Roll at the Brooklyn Museum boasted a 45 minute set by Blondie: A fitting affair for an exhibition of rock 'n' roll photography. While it was much too crowded to spend sufficient time soaking in every shot on display before catching Deborah Harry & Co., the power of the exhibit was still palpable. Curator Gail Buckland's attempt to capture lightning in a bottle integrates video, stills, album covers, collage, and even a DIY section for visitors. In works by Diane Arbus, David LaChapelle, Annie Liebowitz, Mick Rock, Ross Halfin, and so many others, the kinetic dynamism depicted at once forces the photographer to be elevated to rockstar status yet subsumed by the awesome musical subjects before his or her lens. Thus, the integration of subject and object is seamless. From Elvis, James Brown, Fugazi, Pavement, and The Cramps, to Run DMC, the New York Dolls, and Amy Winehouse, nearly every genre is covered. The section of fan photos includes Norwegian Black Metallers in the same breath as grungey Alternative rock kids, and the album art selection has work by lesser known bands right near canonical classics. As for Blondie, I was expecting a short and sweet tossed-off set, but to my surprise we got a real rock show. Debbie looked fantastic in a black satin suit jacket and skirt with blood red beads dripping off in slashes here and there. The band was in fighting form, (Chris Stein did a hot roadhouse blues solo bit), and the lighting was also stunning against the cavernous Roman architecture of the Beaux-Arts Court. The band opened with "Call Me," followed by their only photography-related song (in the words of Ms. Harry), "Picture This." The juxtaposition of old, young, art world and rock world was apparent even in the first few rows: Blondie's genre-bending appeal is indeed far-reaching. Debbie's well-loved rhymes in "Rapture" were shouted out by the audience, and when Blondie played Michael Jackson's "Don't Stop" it was hard to believe it wasn't one of their origials. Plenty of audience participation made the night quite intimate, despite the crowd, and the band's set ended on a high note with "One Way or Another." Not bad at all for a bunch of old punk rockers. 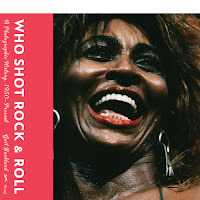 Who Shot Rock & Roll: A Photographic History, 1955 to the Present opens today and runs through January 31st.